A new campaign is spreading its wings this December: Recycling Cameras for Chile. The goal of this campaign is to send 15 new or used digital cameras down to the OJOS nuevos photography program in Santiago for kids at social risk. Voluntarios de la Esperanza, or VE, is a non-profit organization that brings volunteers from around the world to Santiago de Chile to create educational, recreational, cultural and social programs for children who have been abandoned or abused and thus live in shelters. VE works at 14 children's institutions, helping over 1000 kids. OJOS nuevos is proud to mark its first full year as a program with VEGlobal. OJOS nuevos is currently in only one shelter, but with new volunteers arriving every three months, programs are passed along so they continue and grow. It's not human power that's threatening the future of OJOS nuevos: it's the lack of cameras. OJOS nuevos is a social documentary project that puts cameras in the hand of youth and teaches them to become visual storytellers, capturing what life is like for them in Santiago de Chile. 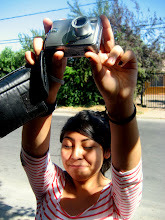 Using digital cameras and computers in the shelters or in local libraries, 16 girls and young women have participated in extensive workshops where they learned the basics of image-making, watched slideshows exposing them to photos from around the world, and learned about the history of the medium. They explored their city and their personal reality, experimenting with journalism and self-expression. In more advanced classes students learned to share their images with the world on blogs and public websites. A fieldtrip to the picturesque coastal city of Valparaíso, two hours away from Santiago, allowed students their first visit to this port and showed them the thrill of discovering a new place through the lens of a camera (see photos here). At the most recent end of the workshop exhibition, over 100 young women, staff members and volunteers celebrated the photography of 10 participants in one of the most prestigious photography institutes in Chile, Instituto ARCOS, located downtown Santiago. After five months of study, this final exhibition allowed these young women a public space to show their work and to tell their own stories from their perspectives (see photos here). We are counting on you to help continue the momentum of OJOS nuevos in Chile. New and used digital cameras will be collected from now through February. If you see a nice-shiny-new point-and-shoot on sale, we would be honored to accept the donation! 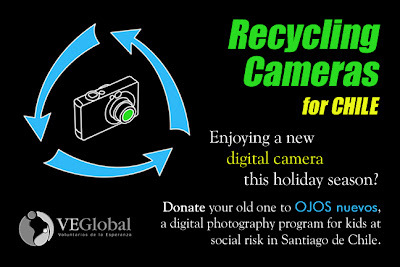 Or if you have received a nice-shiny-new digital camera for the holidays, maybe you would like to donate your old one and recycle the same act of giving. Please contact ojosnuevos.chile[at]gmail.com to arrange a donation, if you have questions or want more information. Included in your donation will be shipping the camera to Chicago, IL, where we can arrange one bulk shipment of the cameras to Chile at our expense. Thank you!